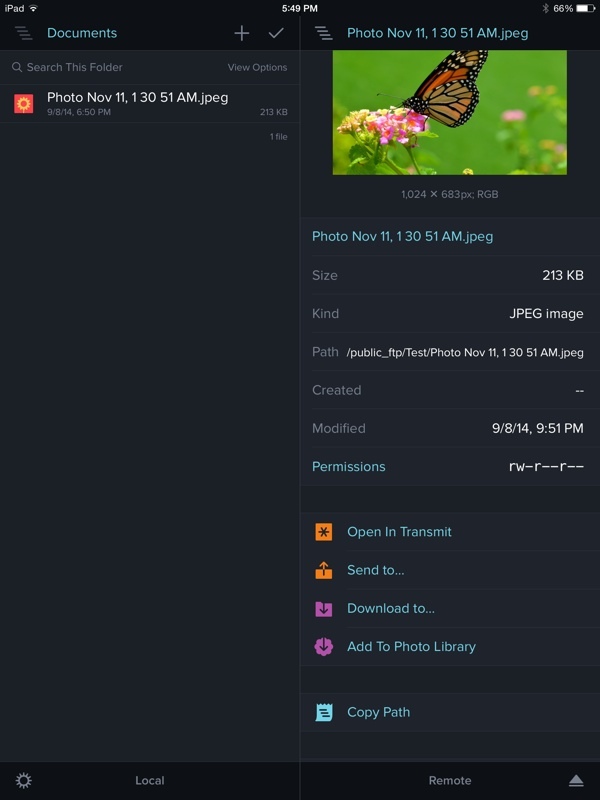 Panic, the company behind the popular file management app Transmit for Mac, has plans to bring Transmit to iOS in the near future, taking advantage of several new features introduced with iOS 8. Currently in beta, the Transmit iOS app offers a look at some of the impressive things both developers and end users will be able to do with Apple's new operating system. Aside from offering access to files on servers, Transmit also serves as a local file repository that can be accessed by other iOS apps. Transmit iOS also takes full advantage of the "Extensibility" options bundled into iOS 8, especially the "Share" extension that allows apps to easily share content with other apps. When installed, Transmit iOS can be accessed in any share sheet in iOS, and used to save any type of file directly to an FTP, SFTP, WebDAV, or Amazon S3 server or to local storage within the app. For example, selecting Transmit iOS from the Share sheet in Safari lets an HTML page be saved to a server. 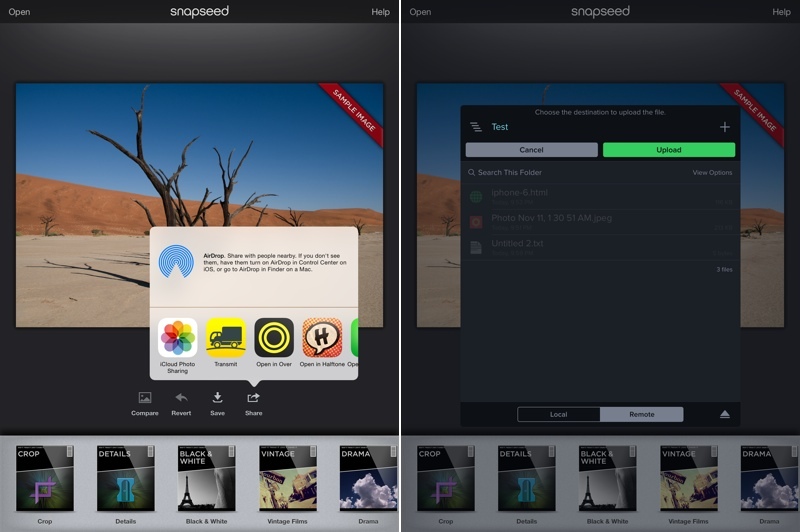 Selecting Transmit iOS in an app like Evernote or Byword will allow a text file to be uploaded, while selecting the upload option in a photo app like Snapseed lets users save a photo directly to their personal servers using Transmit iOS. With share sheet support, uploading a file to a server via Transmit iOS is as easy as uploading a file to a cloud storage service like Dropbox, and it works in quite a few third-party apps in addition to pre-installed apps. Transmit iOS also serves as a "Document Picker," which means that it can be used in supported apps to open files stored directly off of a server. For instance, a Pages document stored on a server can be opened directly in the Pages app on iOS through Transmit iOS, and any changes made in iOS to that document will be saved to the original file in Transmit iOS. 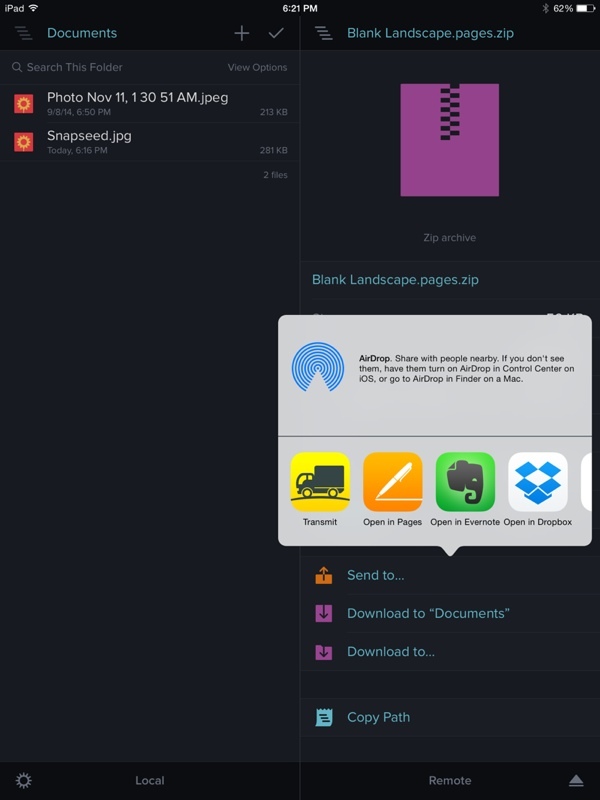 Transmit iOS, like Transmit for Mac, is a full featured file management app. Users can connect to multiple servers, save favorite servers, upload files using drag and drop, delete content, move content, duplicate files, and easily transition files between local storage and an available server. The app's local storage option also allows it to store documents from other apps directly on the device. Transmit iOS includes support for Touch ID, allowing users to secure the app with a fingerprint. A passcode lock is also available on devices that do not have access to Touch ID, ensuring that all content remains safe and access to servers is restricted. As can be seen in Transmit iOS, iOS 8 is going to enable a slew of useful features that have not previously been possible with iOS, and thus far, we're only scratching the surface of what developers are going to bring to the operating system with the new APIs. Panic plans to release Transmit for iOS 8 after iOS 8 becomes available to the public on September 17. Looks pretty awesome. Thanks for being great, Panic! iOS 8 is out and Panic still haven't updated their Prompt (https://itunes.apple.com/app/id421507115) app for iOS 7. $7.99 is a pretty high price for a single-purpose, basic app like this. Basically all they have to do is replace the keyboard with the iOS 7 one and that's that. I won't be buying anything Panic ever again. So all you're upset about is a slightly differently rendered keyboard? They're working on Prompt 2. Which, yeah, you have to pay for. $7.99 is not high for software well designed and useful to professionals. Nobody is going to make a living selling a 99cent FTP client. This is great news for me, Transmit is part of my everyday workflow. They also have a great product in Diet Coda, but this will make my iOS workflow more closely match my OS X workflow. An article highlighting something this awesome - the kind of functionality iOS has been screaming out for, showcasing the potential iOS 8 has and it gets less than 30 comments. The 37th iPhone 6 case leak, hundreds of comments. It does put this forum into perspective. Panic have done what looks like a really nice job here. Looking forward to it. [/COLOR]Extensions are extremely convoluted. Why on earth would anyone use Transmit to find a Pages document and open it in Pages? In case the Pages document is saved in some directory somewhere that Pages can't open from? How did Pages save it there to begin with if it can't open from there? What great use is that of Extensibility? You have misunderstood. Transmit started out as an FTP client and that's still what it is. The article is saying that you can open a Pages document, even though it is stored on an FTP site or other non-iCloud storage. Pages cannot do that. They need to realize that developers get very little per copy. Apple takes 30% of that 99 cents you pay. How many apps would you have to sell at 99 cents each to make enough to survive and make it worth your time to keep building that app and adding features, etc. That's not and never should be the customer's concern. As the customer if I see a price tag on a product, all that matters to me is the price on the tag. It's up to the retailer to make sure the product is appropriately priced with necessary margins to cover the costs of selling that product. If all the retailer gets in the end is a negligible amount of money, that's the retailer's problem, not mine as the customer. The other problem I have with this argument is that it goes the other way as well: developers must acknowledge the cost of putting up software on sale on the App Store in the first place. Much like putting up products on store shelves doesn't come for free, developers have to recognize the value of visibility on the App Store, for which Apple takes a 30% cut per sale. Whether 30% is too much is beside the point: developers must abide by Apple's terms before selling anything on the App Store. If the developer agrees to the terms of the contract and knows beforehand that Apple takes a 30% cut per sale, it's the developer's sole fault if they're not making a living with a 99 cent app. That's the cold truth no matter how you look at it. Finally, there's the culture of economics to consider. How much a customer is willing to pay for a product is defined by the market, as well as the qualities of the product. Whether we're talking about software or tangible goods, the same principle applies. Because developers have run with the 99 cent app idea for so long, customers have been trained to think apps are worth 99 cents. Any app with a higher price tag will have less downloads than a comparable 99 cent app. You can't blame customers for not willing to pay more if the market has trained customers to believe apps are worth 99 cents.